In the social Virtual Worlds context, 2006 was about hype... another new frontier 'kid-on-the-block,' but became about fast bucks and cheap and cheerful PR. We saw that bubble gently burst in 2007 as the realisation that one world in particular, Second Life® (which is still the leading example of culturally created virtual content), was really about creative communication and artistic expression versus the local shopping mall or a crude business tool. 1. An immersive expression of community - Facebook and MySpace-meets-World of Warcraft. This community can create their own environments or swarm around trusted film, TV or lifestyle brands, too. 2. For business, it is more about a place to meet, present and recruit and far less about brand awareness, product sales or vacuous hype. The business model in 2008 clearly came into focus: the community selling to itself - brands needed to court existing inhabitants very carefully. 4 A creative tool. 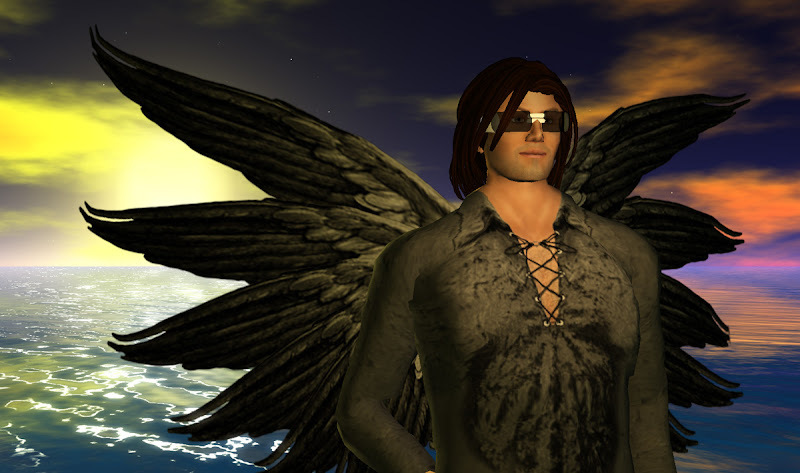 Second Life, in particular, showed significant maturity as we saw a higher number of serious live performance (CARP, NMC, DanCoyote Antonelli, for example), a record number of in-world 'machinima & TV-like programs' and by far the largest array of creative statements from virtual environment artists, many members of the NPIRL group. The quality of 'experience' creation from talented musicians, designers, photographers, artists, etc., reached new heights. Investment across the board - more than $900 million US invested since Oct 2007 - has moved away from generalist worlds like Second Life to more focused niche or user base environments with many starting to exhibit core game elements. These include those with renewed investment after new'ish launches: vSide, Football Superstars, Stardoll, Home, IMVU, Metaplace, Multiverse Places, and Music Mogul. Towards the end of the year, console social worlds came onto the scene. XBox360 and Wii are very similar in 'cartoon' aesthetic, whereas Sony is far more game focused. All have very similar business models - create a space to hang out and be 'tempted' by games/film/merchandise. Although these are not yet places for community creation, they will soon learn that to keep inhabitants they will need to be or, like Google Lively, have to pull the plug. Embeddable or layered worlds began in 2008 and are likely to be significant in getting people used to real time communication through 'representational' avatars - vs text based 'social network' profiles. Also, Facebook worlds like YoVille or Vivaty, or layered worlds like Rocketon or Weblin that are embedded on the existing 2D web. The dominance of the likes of Club Penguin and Webkinz at the tweens end of the spectrum will be duplicated through teens and gen y's as a series of new, highly focused and targeted social worlds launch next year. This has already begun with Football Superstars and Music Mogul but expect to see many more - including several with user created content as a feature alongside the virtual economy. - Graphics in Second Life become teenagers. Still some way from the likes of Crysis, Second Life Windlight turned the world into something far more fantastical for many. It added layers of light, glow and control to a previously very 'flatly lit' world. We still wait for dynamic shadows, better environmental sound and an even more useful scripting language (post Mono), but this was a paradigm shift for environmental artists. - Some companies got it! 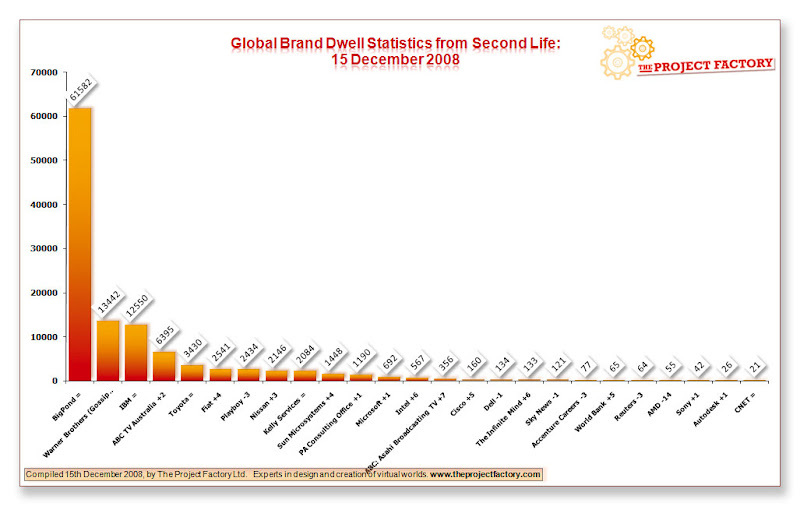 There was not a plethora of companies or brands entering Second Life but those that did had continued success as they concentrated on the social (people) rather than 'product' aspects of their business. Although the Pond leads in dwell terms, new entrants like Warner's Gossip Girl have done exceedingly well. Car companies still do well even though Pontiac walked away from Second Life, and Toyota, Fiat and Nissan are always in the top 10 brands. - The quality of machinima across all social and game worlds increased exponentially this year and a growth in communities watching 'documents' of the worlds they spend most of their time in. In addition to some machinima appearing in heritage media ("Molotov Alva and his Search for the Creator" and HBO/Cinemax, for example) there has been a growth in long form game-engine films and notably many more serious issues tackled. - The New Worlds. A fracturing, as it became obvious that Second Life cannot be all things to all avatars - so nearly 70 other worlds all showed up on the radar. Many are focusing on niche interest or are highly branded. Several of the new 'jack-of-all-trades' entrants will learn that enabling community creativity and an economy is absolutely necessary. There were several walled garden/locked content mirror worlds and builds in 2008, which will learn to be not about 'broadcast' spaces, and realise that their worlds are far more significant than modelling what is around us - "In augmented and online virtual worlds, humanity will exponentially evolve, free from the limiting ghosts of that other virtual world we called reality". I would think the dwell data on Telstra's site must be somewhat skewed by the fact that in a pay-by-download Australian internet community the Telstra customers spending time on The Pond (as opposed to anywhere else in SL) don't have that particular download counted against their total. As far as I know it's the only set-up like that in SWL.